(1862-1917) Painter. Born in San Francisco on June 13, 1862 of French parents. Joullin studied locally at the School of Design and with Jules Tavernier, and furthered his art studies in Paris at Academie Julian and Ecole des Beaux Arts under such masters as Robert-Fleury, Bouguereau, and Lefebvre. 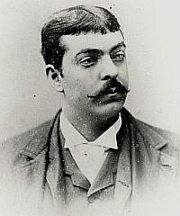 He spent several years during the 1880’s in Paris and upon his return to SF established a studio at 207 Sansome Street. He was an instructor at the SF School of Design from 1887-1897. At the turn of the century he spent nine months in New Mexico living among the Pueblo Indians and produced a great many paintings of that tribe. Although he is best known for his Indian subjects he has also painted still lifes, landscapes, Chinatown scenes, and portraits. His painting of the driving of the last spike of the Northern Pacific Railroad now hangs in the State Capitol at Helena, Montana. Shortly after the turn of the century he and his wife Lucile lived across the bay in Marin County for a few years and produced many landscapes of that area. He died in San Francisco on Feb. 3, 1917 at his home at 1011 Florida Street. Member: Bohemian Club; American AA, Paris. Works held: Bohemian Club; Olympic Club; DeYoung Museum.